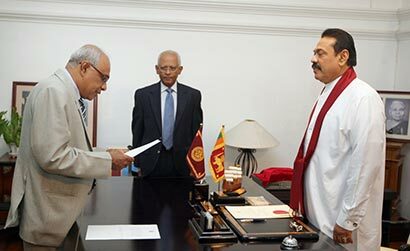 Former Solicitor General, President’s Counsel Sarath Palitha Fernando was sworn in as the new Attorney General of Sri Lanka before President Mahinda Rajapaksa a short while ago at Temple Trees. Secretary to the President, Lalith Weeratunga was present at the occasion. President Rajapaksa has appointed former SG Sarath Palitha Fernando as the new Attorney General of Sri Lanka with immediate effect, press release issued by Wijayananda Herath, Coordinating Secretary to the President (Media) at Presidents Office reported this morning. His appointment was approved by the Parliamentary Council on 12 July 2012. New AG Fernando, who was previously the Solicitor General, was appointed as the Acting Attorney General while former Attorney General Mrs. Shanthi Eva Wanasundara was sworn in as a justice of the Supreme Court before the President at Temple Trees on 05 July 2012. Sarath Palitha Fernando is an old boy of Royal College, Colombo-07. He led both the College English and Sinhala debating teams, also served as Student Chairman of the College English Literary Association and a General Secretary of the Sinhala Literary Association. He passed the Preliminary and Final Examinations of the Sri Lanka Law College with First Class Honours. He also holds an LL.B degree from the University of Colombo as an external student, Master of Laws in International Law, University of Colombo and Master of Laws (International Commercial Law) University of Bristol, UK. He was awarded the Prize for Commercial Law, for securing the highest marks at the Final Examination and the Hector Jayawardena Gold Medal for being first in the address to the Jury Contest in English. After having joined the Attorney General’s Department of Sri Lanka as an Acting State Counsel in February 1980, he was promoted to the post of Senior State Counsel in 1989 and Deputy Solicitor General in 1997. Sarath Palitha Fernando PC was head of the Legal Division of Sri Lanka Navy and Judge Advocate of the Sri Lanka Navy till 2004. He had served as prosecutor and also Judge Advocate at several Courts Martial of all three Services.